The day started with a leisurely breakfast at the back of the restaurant where there are some super panoramic windows overlooking the stern of the ship. 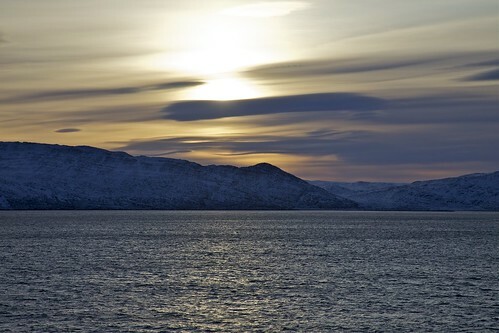 Just as we were finishing breakfast the sun started to pop out through the ever thinning cloud, so it was a great opportunity to put on some of the warmer clothing that we had brought and go out on deck and take some photos. About time really as so far I haven’t really done the photography justice. Well once started it is difficult to stop, so I spent the next couple of hours wandering round taking the odd shot here and there, as you do. 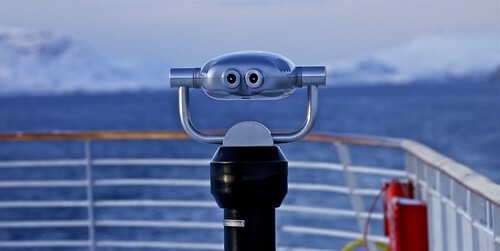 The ‘eye glasses’ on the aft deck would appear to show things at about the same size that you can see with the naked eye so I’m not too sure what use they are, having said that they are quite an interesting object, and anyway Steph seems to like them. 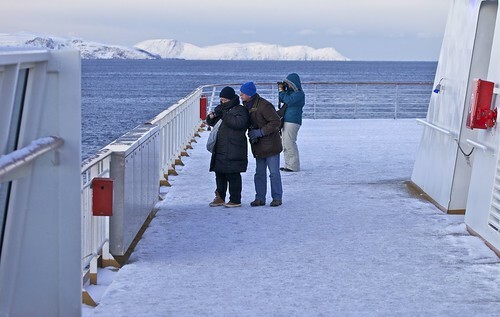 As you can see from the following photo I wasn’t the only person wandering the icy decks. It was certainly cold and photography was interspersed with the occasional dash inside to try and warm up a bit, not that I was that cold but the tips of my fingers ached something chronic. 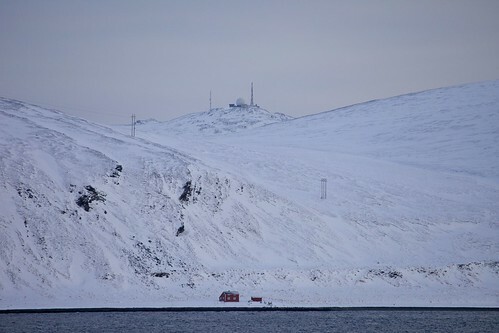 I rather hope that the photo below shows just how isolated, and desolate, many of these coastal areas are. It’s hard to tell from the comfort of the ship whether theses places are permanently inhabited or if they are only winter or summer homes, however I’m fairly certain that the majority are peoples homes. Lord only knows what you do when you run out of toilet paper! 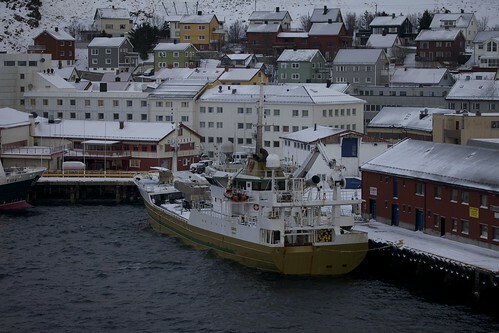 At 11:45 we arrived in Honningsvag and as the ship was not due to sail until later in the afternoon we decided to get off and have a wander round the town, such as it was. 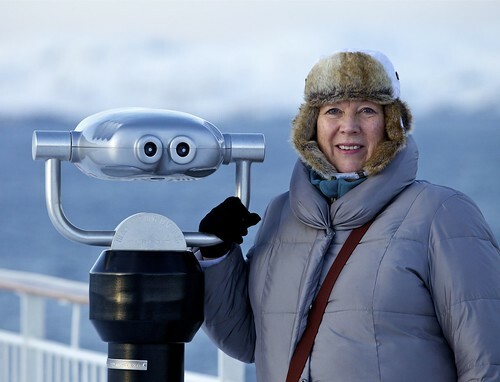 It’s main claim to fame is that it is where you go to see the North Cape, a goodly number of the passengers took the excursion to the cape. Apparently it is very beautiful, if a little windy! Our tour of the town took us passed the many fishing vessels that seemed to be constantly coming and going, both small and large. Luckily there are not too many shops so Steph didn’t manage to buy anything, even though she was eying up some woollen blankets. She might even have been seriously tempted until she saw the label that said they were made in Peru and not Norway, mind you there is probably a good reason for that as we later saw one on the ship that was made in Norway and it was only £117! While walking up the main street we came across a very eco friendly mode of transport that, coming from England, we tend not to see very much off. Here in Norway most women, and even children, have one, whatever could it be? 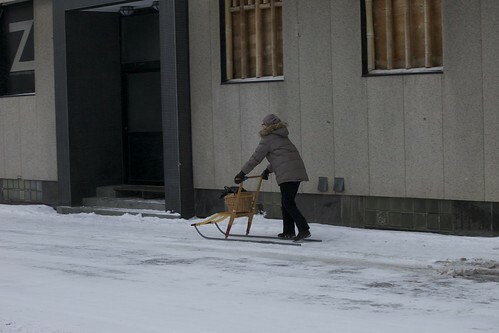 Well it’s quite simple really, it’s a sledge, not pulled by anything just pushed along by your feet and ridden once in motion. 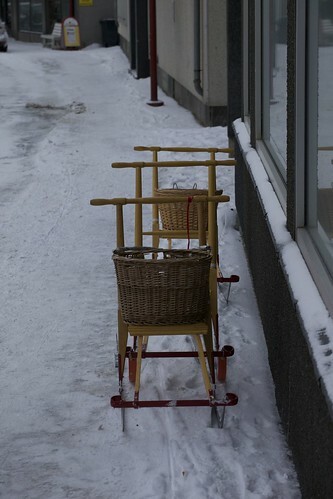 It’s quite amazing to see them dotted around the town like we would see bikes, outside shops, in the school playground. I don’t think that they carry any parking restrictions and of course you don’t need a licence! We came back via the waterfront, stopping to take photos and generally looking around. 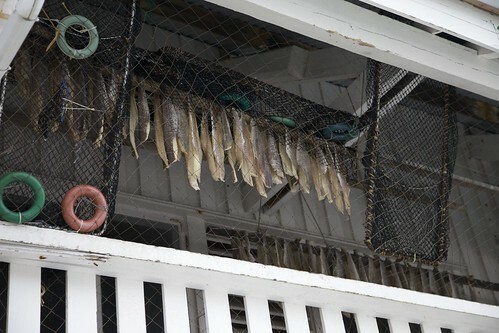 We were incredibly lucky to see some cod hung out to dry. It is just hung out to air dry naturally, no chemicals or preservatives. When it is finished drying it is called stockfish and can easily be used in all sorts of dishes, in fact we had grilled stockfish for dinner a couple of days back, it’s probably a bit of an acquired taste as it tends to be a bit rubbery in texture rather than the flaky texture that you expect from white fish. We got back on the ship just in time to have some lunch, God forbid that we should have missed our lunch, how on earth would we ever have survived till dinner! As it happens around 3:30 when the excursion passengers were back on board and the ship had sailed we were informed that we could buy Norwegian pancakes in the cafeteria for 35 krone, well you have to try these things don’t you? Down we went and joined the queue for the said items, turns out that they are a bit like the American pancake although possibly not quite as thick. There were 3 toppings and we were advised by a Norwegian lady in front of us that we should try all of them, the sour cream, the butter and sugar mixture and the berry type compote. Very, very nice if just a little OTT. That of course wasn’t the end of it, oh no. 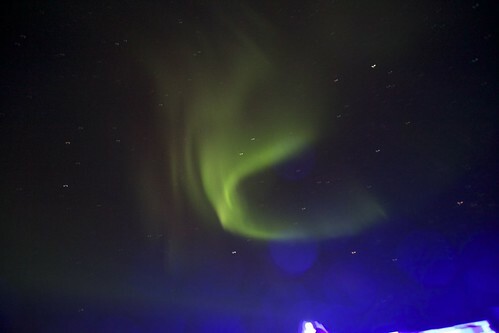 Around 4 or 5 there was an announcement that we would shortly passing a Sami church in the rocks, “bring your cameras it will be lit up”, off we dully went to put on the thermals and get the cameras. Up on deck 9 we stood, buffeted by the wind, starring hard into the darkness to see the said church in the rocks, well yes it was lit, but sufficient for a camera, not a cat in hells chance. I pumped up the ISO to 6400 and at 1/80th this is all that I managed, so lord knows what anyone with a point and shoot achieved. 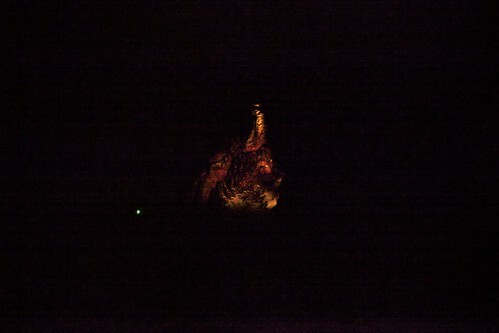 Was it a church, was it a shrine or just lit up rocks, even with the naked eye it was impossible to make out clearly, suffice it to same that to the Sami it is a sacred place. 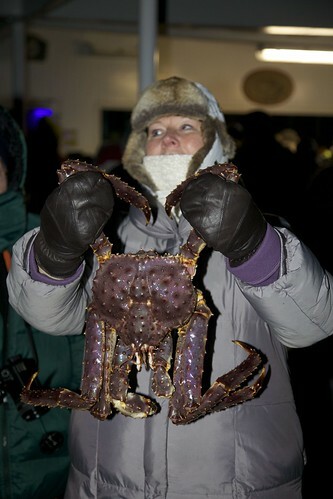 We stayed on deck, even though it was perishing cold, as a man had come aboard in Honningsvag with a bunch of King Crabs and Steph wanted to have a good look at these beasties before she ate some latter for dinner. 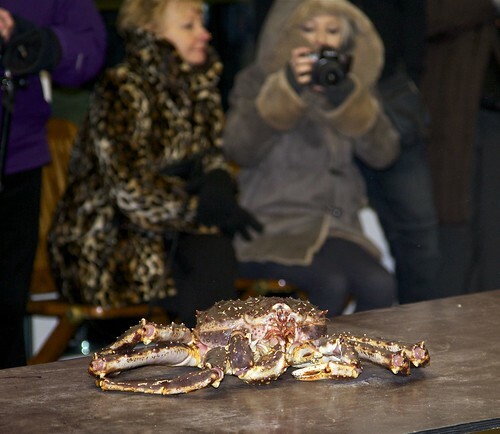 Apparently these creatures where introduced into the area by Russian researchers many years ago and have spawned a thriving local fishing industry. And yes they were all very much alive! Needless to say none was prepared as the likely hood of a sighting had gone down from a 3 to a 1, so everyone was rushing hither and dither. People rushing out of this door or that door, people running up stairs, down stairs, up the corridor, back down the corridor. Into cabins, out of cabins, on with boots, jumpers, jackets, gloves, hats and not forgetting the cameras! By the time I had packed up the laptop and rushed down stairs to get my gear Steph had long disappeared, not to be seen by me for a good hour, although apparently she accosted a number of other men carrying large tripods with cameras attached. Turns out that she had gone up to the top deck (deck 9) whereas I had initially gone to deck 6 where it was much darker. 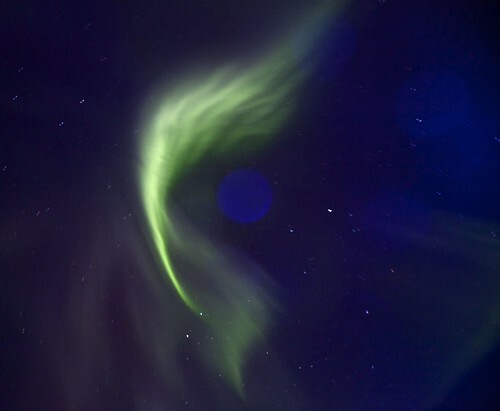 At first it just looked like a wisp of cloud, not at all colourful but eventually it did become more pronounced. 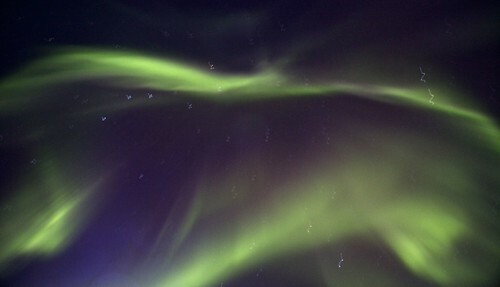 I just stood and watched at first not too sure what I was actually seeing, was it really the Aurora, was it? Well I fired off a couple of quick shots which produced nothing of any value whatsoever. 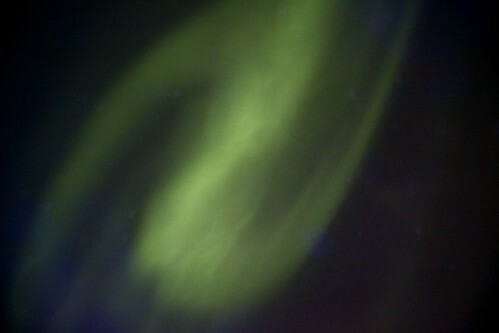 I made my way up to the top deck and there it was, Aurora Borealis, it truly was and all I could do initially was stare. This wasn’t a particularly fantastic display, no real distinct colour as you would expect but it was undoubtably the Northern Lights. I went and found an empty spot set the tripod up and started taking photos. It’s difficult when you’re on a ship that is traveling at some 15 knots to take extended exposure shots, but at the end of the day that’s what I did. They are certainly not brilliant, and some were out of focus because the camera could obviously not auto focus and I couldn’t remember which way was infinity and in the darkness there was no chance I could actually read the scale, and no I couldn’t see a damn thing through the viewfinder. After about an hour or so it had all but gone, and I was freezing anyway, so I packed up and went to find Steph who by this time was warmly sat in the Library. 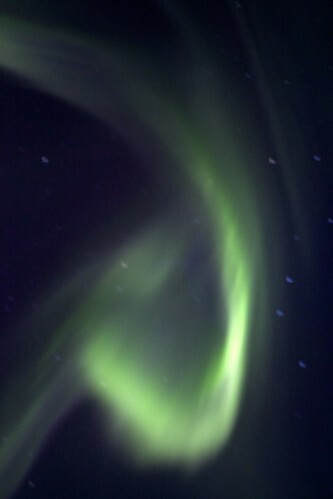 We were happy, we had seen the Northern Lights. 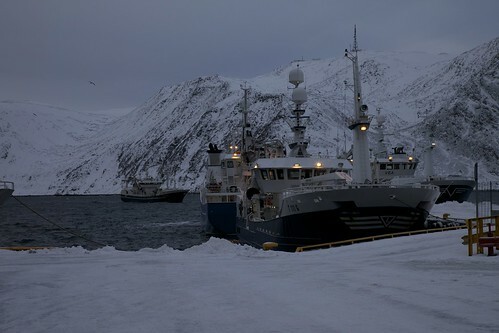 Shortly after the lights had gone we docked at Mehamn at 71 degrees north. After dinner I went and sat in the library and put the first photo up on Facebook and started sorting out this blog. when all of a sudden around 10 the call went out again, they were back and for the next 2 to 3 hours we were on deck totally enthralled. 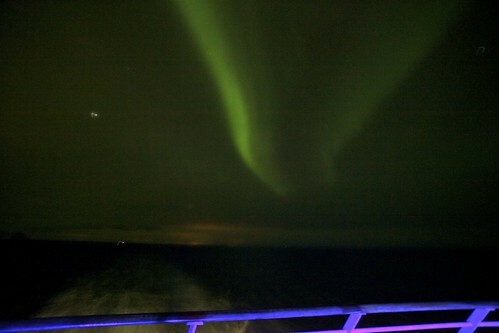 We spent most of the time up on the top deck but did at one point try and get to the front of deck 6, unfortunately the driving wind and arctic conditions meant we didn’t get very far which was a real shame as there is much less light pollution down there. I did manage one short bout by the rail to be totally amazed by the most brilliant display of lights just off the port side of the ship. It took me several hours to get warm again when I finally got into bed around one thirty.